Last year I managed to get away for 2 weeks for a holiday which was more like an adventure. I travelled over 2,000 kilometres across the North Island of New Zealand, also known as the Shaky Isles, and for good reason. 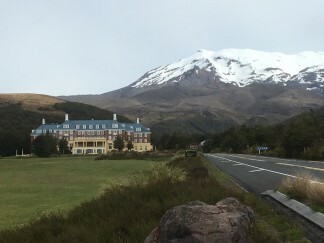 Let’s be honest, New Zealand is a chain of volcanoes, both ancient and alive. The point is the ancient ones could always come alive. Every so often the earth groans and with it places fall and the landscape changes. You get this sense that the whole place is fluid and unpredictable. The Maori culture has had to adapt to this environment and so has the modern New Zealand. The best example of this was Lake Taupo in central NZ. It is in the caldera (like a crater, but really a type of sinkhole), created by a supervolcanic eruption, which occurred approximately 26,500 years ago, of the Taupo Volcano. With a surface area of 616 square kilometres, it is the largest lake in New Zealand. It has erupted 27 times since that massive eruption and one year there were historical recordings of a whole year in which the sky was red over ancient Rome and China! 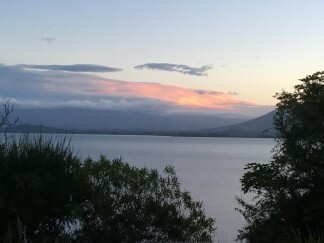 The volcano is currently considered to be dormant rather than extinct because of areas around the lake where steam and gases such as carbon dioxide, and hydrogen sulphide are released and the hot springs along the shores of the lake. You look up at the hills surrounding the lake and you think it’s strange to see fog still in the ridge valleys in the middle of the day, but it’s actually gases coming from underground. The most amazing site was the short drive to the snow fields near the lake. The drive from the lake, where it was quite a hot day, to the snowfields, where there was still snow, took 45 minutes and a 20 degree drop in temperature. It was freezing! Well on the way back we stop off at this beautiful chateau for afternoon tea. 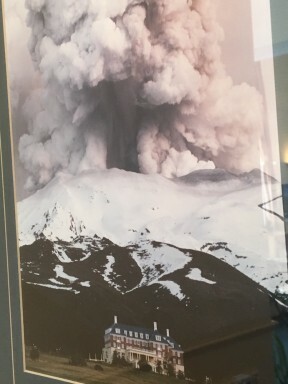 There were photos on the wall showing the chateau in front of an erupting volcano! 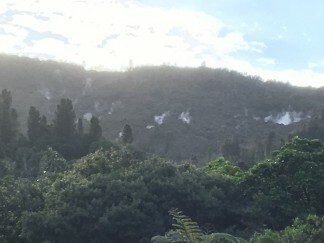 I later learnt the people were still skiing on its slope while it was erupting. This could explain why nothing fazes New Zealanders or maybe, that tourists are basically crazy!